Soap and Glory body/skincare products have quickly become my favourite brand and my stash has increased over the past year (Thanks to Boots 3 for 2 offer which is still on). These lovely products have literally made my general morning routine really exciting especially during Winter when I just want to be in bed all day long. Most of them are full size products but I also have two minis which look so cute and currently reside in my handbag. I didn't buy them all in one go; they were purchased between last year and last month. 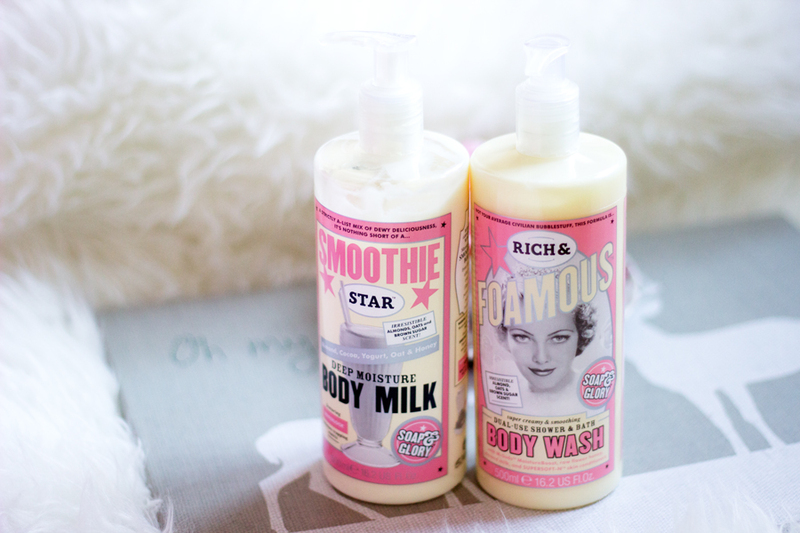 The Rich and Famous Shower Gel has already been featured on this blog a few times here and here and I just love it so much. It's infused with Almond, Brown Sugar, Oats and other yummy ingredients. Seriously, it takes a lot of willpower for me to resist tasting this shower gel because it smells incredible. I love how it moderately lathers up in the shower with my sponge and it feels so good and leaves my skin moisturised. The scent lingers for a little while immediately after I shower but it slowly disappears. If you don't like sweet scents/fragrances, then this won't be for you but they have other lovely shower gels/washes in their range. 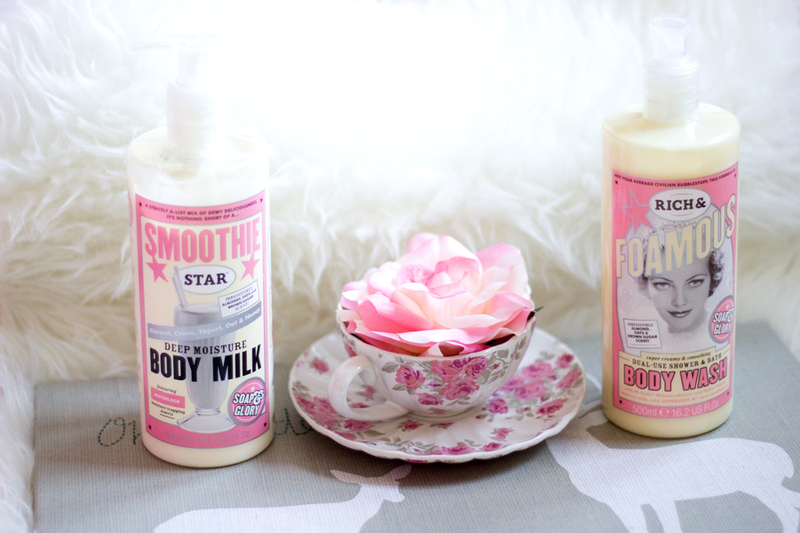 I also picked up the Smoothie Star Body Milk because I was searching for a body milk/moisturiser from their range to complement the Rich and Famous Body Wash. I searched high and low for one with a similar name to no avail. 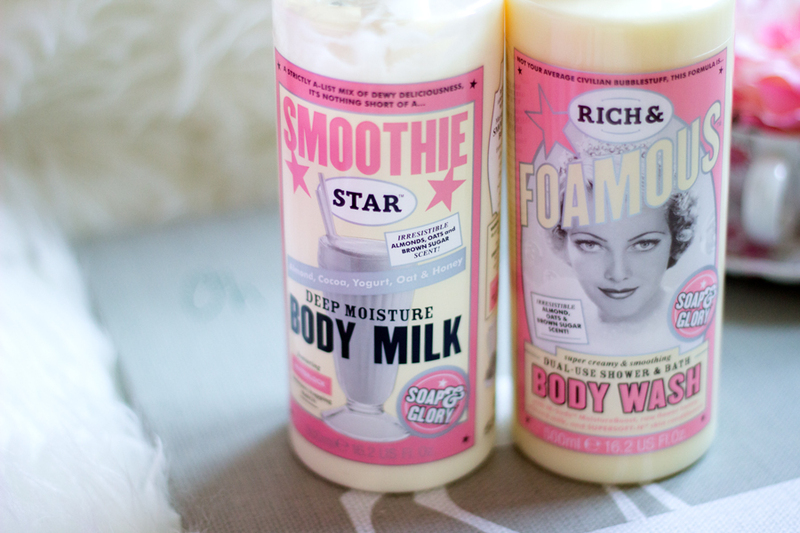 Unknown to me, it had a different name but similar ingredients and fragrance and it's actually written on the bottle that the Smoothie Star Body Milk pairs well with the Rich and Famous Shower Gel. Phew! Its ingredient list includes Almond, Cacao, Yoghurt, Oat and Honey (who's hungry now?). 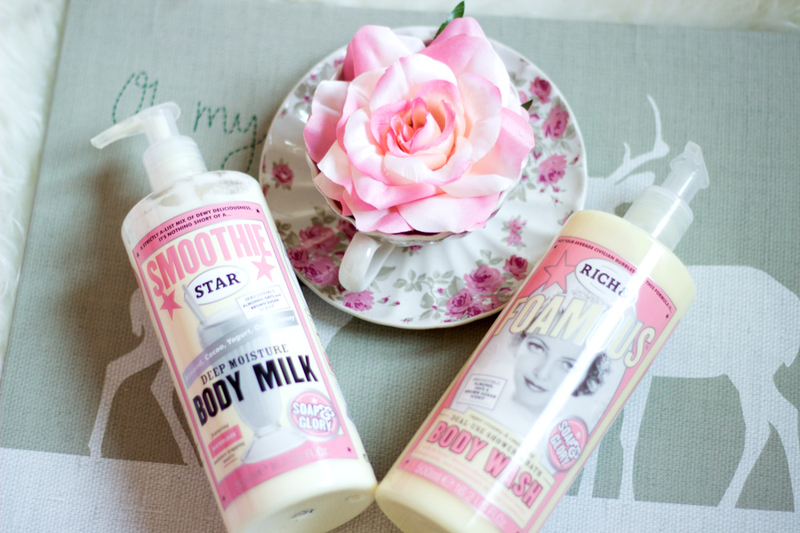 This body milk feels so moisturising but not greasy and it gets absorbed quickly. I don't think it is the best at keeping the skin hydrated all day if you have dry skin but it's perfect for me even now that it's winter. The best part is the fragrance lingers even longer than the shower gel, in fact, it lasts longer when you use it straight after a shower with the body wash. I love that both the body wash and moisturiser come with a pump so it's super easy to use even in the shower. The first ever scrub I tried from Soap and Glory was this Sugar Crush Scrub which I received as a birthday present and I already have a review here. I absolutely loved it because it just smelt so good and was very effective as a gentle body exfoliator. It has since finished but I didn't repurchase it because I didn't like dipping my hand in the tub packaging while in the shower. It was so messy and difficult to keep clean. When it was time to repurchase another Body Scrub, I saw that Soap and Glory had some scrubs in a tube packaging and I was very delighted. It means no more messy dispensing and it's much easier to handle. I went for the Pulp Friction Body Scrub because it has a fresh fruity scent which I think is best for scrubs (I prefer scrubs with an invigorating scent). It contains Fig Powder, Pumice, Peppermint Oil, Orange and Lemon Tree Liquids and enriched with Vitamins A, C and E. I think it may even be more effective than the Sugar Crush scrub because its exfoliating beads seem less abrasive and the overall texture is more moisturising. I really love using this especially on my elbows and knees which sometimes get very dry. The fragrance is a very fresh one and you just need to try it to understand how lovely it is. 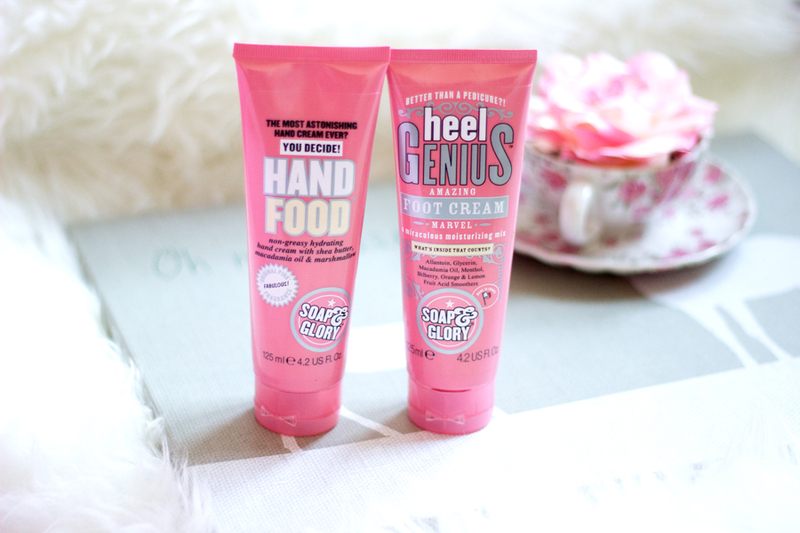 I have to say Heel Genius may be my least used product from the range. I really need to start using it more often because it is very effective for dry/cracked feet especially at night before bed. I love to use it straight after I shower with the scrub because I think it absorbs better into my skin that way. It does not have a fantastic fragrance like the others (I am not a huge fan at all) and this may be down to its Menthol content (it has a blue colour, too!). The other ingredients in its formula include Allantoin, Glycerin, Macadamia Oil, Bilberry, Orange and Lemon Fruit Acids. I have a review on it here if you want to read more about it. As mentioned, it is great for dry feet or feet with corns/cracks as it moisturises and has a slight cooling effect on it. 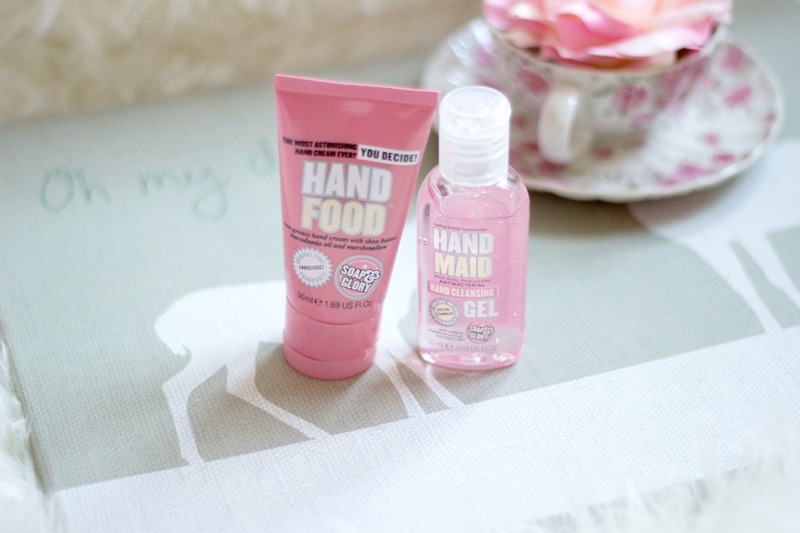 The other product I purchased which I love very much is the Hand Food. I think this is also one of the more popular Soap and Glory products because it smells amazing and also comes in cute mini size (ideal for the hand bag). I keep the full size near my bed for my night time routine. It smells amazing as expected from any product that contains Shea Butter, Macadamia Oil and Marshmallow. I particularly love it because it is non-greasy and it gets absorbed quickly yet it manages to keep my hands moisturised. My favourite packaging has to be these minis. They are pink, cute and portable and they currently have a special place in my handbag because it will be a crime to just throw them in. The Hand Maid Sanitiser/Cleansing Gel may seem cute and girly but it is really effective in keeping the hands clean and free from bacteria. It contains a natural Grapefruit extract (which gives it a nice fruity scent) and X-Bac 99 (which gets rid of bacteria/germs). The texture is non-sticky which is very good in my books because I have used some hand sanitisers that are super sticky and disgusting. It does not feel drying at all and it has no strong smell. It's an absolute hand bag essential especially if you commute a lot. I also have the Hand Food mini because I can (and it looks cute-I have said that so many times, haven't I?). I've been meaning to try this brand forever now. This review was helpful... maybe it's the cure to my dry skin!